Did you know that it costs over £1,000 a year to look after a dog and similar to look after a cat? Well here is a new service that could make that a little cheaper. PetPoints is a new free to use website which helps you with cat, dog (or fish!) freebies. Popular categories include free cat food, free dog food, free pet app and other free pet stuff. Most of the offers you see will be freebies whilst others will be heavily discounted or exclusives. What’s the catch? 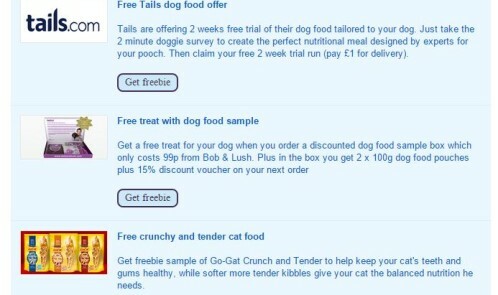 “Well some of our offer partners pay PetPoints to get people to sign-up to their offers which could be free samples or free trials of their services or products”, but you can get free stuff in return for a Facebook like too.